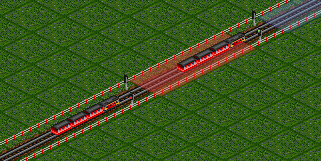 One of the greatest features of Transport Tycoon Deluxe and OpenTTD is the ability to create sophisticated railroad systems. In order to do so, one has to make use of the available signals. 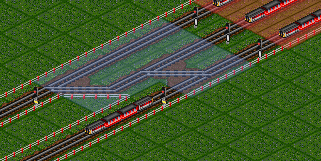 Especially with the 6 different signals available in OpenTTD, this can seem very challenging. But don't worry, I'll run you through all of them. 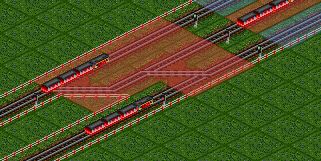 In case you are playing OpenTTD, my advice is to stick to the newer path signals for now. Note that this article is more of a reference or guide rather than a tutorial. It thoroughly explains the way signals work so that you should be able to come up with solutions for any scenario. For usage examples, like common station or junction setups, see the additional links provided. To build signals, select the signal tool located in the railway construction toolbar. When the signal tool is selected, the signal selection toolbar will show up. To remove signals, first select the signal tool, then the bulldozer tool. 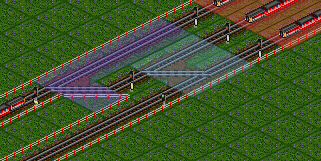 To equip a section of a track with multiple signals of the same type, build the first signal, click on it and then drag the mouse along the track. The selected section of the track will be equipped with the signal. 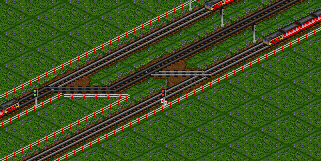 Doing so while holding down CTRL, it's enough to drag the mouse just one field in the respective direction - OpenTTD will then build the signals automatically till the next junction, station or the end of the line. The interval of the signals (when built automatically) can be set up in the bottom right of the signal selection toolbar. There are 6 Signals in total, all with a different functionality. Those are being divided into two categories: block and path signals. Each signal is available in two different styles: as Semaphore or Light signal. It all started with the block signals. 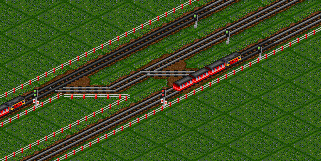 While the block signal itself was already available in Transport Tycoon, the entry, exit and combo-signals were introduced with OpenTTD version 0.2. Today, the relevance of the block signals decreases as most of their functionality can also be achieved with the new path signals. 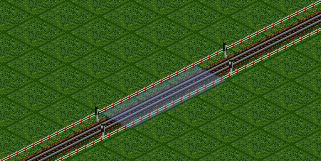 The path signals follow a different concept and were first introduced with OpenTTD version 0.7. They provide some great advantages over the block signals. In addition, they are easier to use. The track between two or more signals is called a "block" or "signal block". When a train attempts to pass a signal, the signal checks the following signal block. A signal block is also closed by a depot, or at the end of a track. Stations don't divide signal blocks, they get included in them! Depots have a built-in signal, so there's no need to place a signal in front of a depot. Combined with ordinary block signals, it will be a two-way block signal. Combined with entry, exit, and/or combo signals, it will be a two-way entry pre-signal. Combined with path signals, it will be a path signal. Combined with different signals, the last named of this list will be used to determine the embedded signal. All block signals can be built heading one (A|B) or two (A+B) directions. The one-way signals can only be passed by trains coming up from ahead. Due to this, one can define in which direction trains can pass the signal. The block signal turns green if the following signal block is free, otherwise it turns red. In case the following signal block has any exit or combo signals, at least one of them has to be green in order to make the entry signal show green. This is still true even if the signal block has one or more green block signals in addition. Solely combined with block signals, the entry pre-signal behaves exactly like a block signal. It triggers preceding entry or combo signals. See the description of the entry pre-signals. Solely combined with block signals, the exit signal will behave like an ordinary block signal. 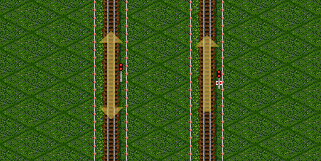 Since all following exit signals are red, the entry pre-signal won't let the train from the bottom right pass - even though the signal block (marked blue) is free. Important: the entry pre-signals don't consider the route of the train. Therefore, they'll also show green when the exit signal on the left or in the middle changes to green - although it's impossible for the train to get there. The combo signal combines the characteristics of the block, entry and exit signal. Therefore, it triggers preceding entry or combo signals and will only show green if at least one of the following exit or combo signals shows green. Solely combined with block signals, the combo signal will behave like a block signal. The block signal is green because the following signal block (marked blue) is free. It doesn't take care of the exit signals. The combo signal is red since both of the following exit signals are red. The entry signal is red since the following exit signal, as well as the following combo signal, are red. Both path signals can be built heading one direction (A or B). Just as with block signals, one-way path signals can't be passed from behind. But: The (two-way) path signal can always be passed from behind, because it's ignored in this case. They allow trains to reserve a path through the following signal block. 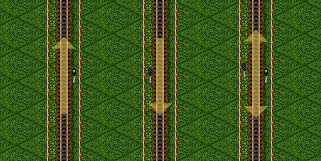 This way, several trains can pass the very same signal block at the same time - as long as their paths don't cross each other. Path signals are always red, except for that short moment when a train successfully reserves its path. Path and block signals can be combined with each other without any problems. 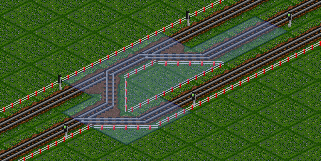 Although there's already one train inside the following signal block, the second train can pass the one-way path signal because it can reserve a free path through the signal block. The train from the bottom left reserves its path through the signal block. For it, the signal block doesn't end at the following reverse side path signals. In the opposite direction, two trains wait for a free path. The track at the bottom/right is no option, since the one-way path signal up ahead can't be passed from behind. Note: I disabled the comment function because of spam. ENGLISH (since you asked) --- With the signal tool selected, the signal selection toolbar shows up. - This sounds a bit weird. Perhaps "When the signal tool is selected, the signal selection toolbar will show up" or "With the signal tool selected, the signal selection toolbar can be used" --- "A signal block is also closed by a depot or at the end of a track." - a comma would make this a bit easier to read (an "oxford comma") example: "A signal block is also closed by a depot, or at the end of a track." --- "Combined with different signals, the last named of this list will be used to decide about the embedded signal." - the words "used to decide about the" sound odd together. I'm not 100% sure what is better, perhaps "used to dictate the" or "copied in the" --- "Solely combined with block signals, the combo signal will behave like a block signal." - the word "Solely" is rare in use. "When combined with" could work but might be confusing, "When combined with only" --- "Both path signals can be build heading one direction (A or B)." - "can be built" as build is to do and built has been done. can be done, not can be do, if that makes sense. --- that's all I can find! Wow!!! This is amazing. The pictures are what sold it. The wiki was just far too much to digest at one time, especially when you don't understand what they are talking about. Once I figured out what was going on in each picture, I finally understand what the hell these signals do - and thus, I can finally understand what the wiki was babbling on about. --- Do you mind if I add these to the wiki in some way? Very nice. However I ended up on wiki. This description on how signal blocks work is probably one if not the best one out there. Also on how to cycle through signals is very well illustrated. Mind to add these pieces of information to the official wiki? Since I'm not a native English speaker, there might be some mistakes in the above tutorial. Please feel free to leave a comment, if you can provide any corrections.